Doremi and Pop&#039;s mom. A rather forceful woman (often seen complaining about her husband&#039;s fishing) and referred to as jealous by her children and her husband. 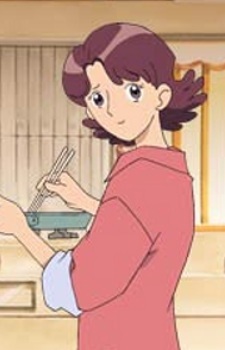 She is nonetheless a caring mother, who is the first to agree to allow her child (Doremi) to continue working in Maho-do when it changes into a Sweets Shop seeing the positive change it has on Doremi. She is also the one who gives Doremi advice when raising Hana. She loves her daughters and is very proud of them. Haruka used to be a famous pianist until she was hospitalized and became depressed, almost commiting suicide. When she learned she was pregnant with Doremi, she regained her will to live. When Doremi was 5 years old, however, she tried to push her dream onto Doremi. When Doremi froze up on stage, she stopped forcing Doremi to learn piano and apologized to her. Later on, Pop asks to learn piano and, although a little hesitant because of what happened to Doremi, she begins to teach Pop piano.